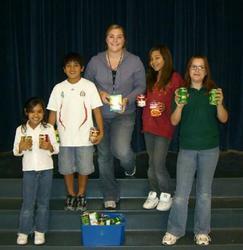 Maricopa Elementary School’s Student Council donated over 1,100 canned goods to F.O.R. Food Bank of Maricopa today. They also donated over 50 toys to the Salvation Army for distribution to needy children in the area. The student-sponsored toy and food drive, to assist needy families in Maricopa during the holidays, was spearheaded by Student Council Sponsor Mark Culbertson. For more information, call (520) 568-5142.